Lately we’ve had a different kind of pumpkin around the house for Halloween. Real pumpkins! Small pumpkins! Large pumpkins! Medium-sized pumpkins! Yay for pumpkins! At Lily’s school, there is a pumpkin decorating contest every fall. Students can bring a pumpkin to school decorated but not carved. 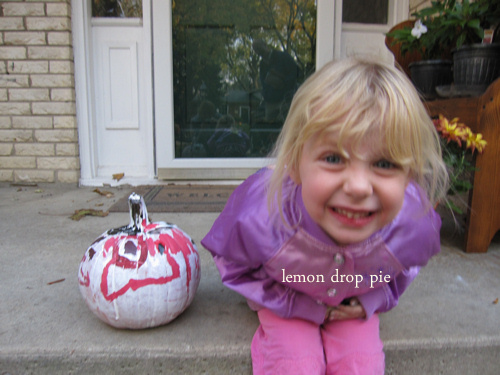 Lily decided to paint her pumpkin as Dracula, and knew that she needed white, red and black paint. Emmy is too young to enter the contest, but we bought a pumpkin for her to paint, too. Emmy decided to make her pumpkin into a ghost, and she wanted some pink on her ghost. What’s a ghost without pink, right? 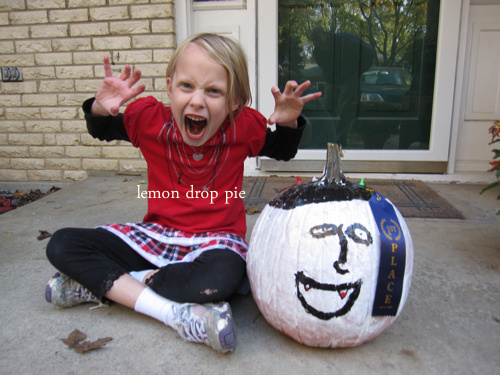 Lily drew her vampire face on paper first and then painted it on her pumpkin. The decorating contest is a popular event, and so I told her not to be disappointed if she didn’t win. So what does she do? She comes home with a first place ribbon!! She won for scariest pumpkin in K-2nd grade. I think it’s the blood on the vampire’s teeth that must have been the winning touch. I kept both of their pumpkins inside until Halloween day, when I put them out on the porch as decoration. Not half-an-hour after I put their pumpkins out on the porch, a squirrel had eaten a hole through Emmy’s pumpkin to get at the seeds! Not only was my porch a mess, but Emmy’s pumpkin was halfway gone! Fortunately, Emmy rolled with the punches, and she said that at least it was only the back of the pumpkin. Yes, the squirrel had the decency to eat the back, not the front. By yesterday, however, the front of her pumpkin was gone, too, and so we carried her ghostly pumpkin to the compost pile. The squirrels were obviously smart enough not to eat the paint, and paint chips were all over the porch. Remember how I wrote we had large pumpkins? Here are our LARGE PUMPKINS, from my brother-in-law’s garden. THESE pumpkins have rinds so thick, the squirrels have no chance of chewing through the flesh to get to the seeds! That hasn’t stopped them from trying, however. Hey, squirrels, how daya like DEM pumpkins? 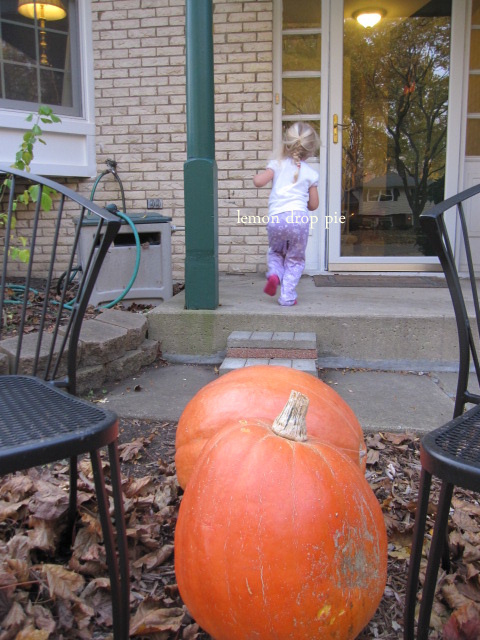 I took these pumpkin pictures this morning, and Emmy came out on the porch, wondering what I was doing. Isn’t she cute in her pajamas? Cute pumpkins! So glad Lily won first place. Those are some beautiful pumpkins in your yard. Well, those certainly differ from my pumpkin!